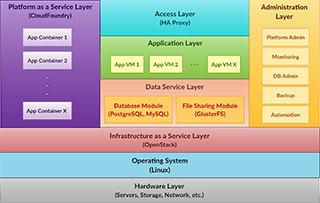 In the case of Thessaloniki the whole migration process also started with the user driven dynamics for application / service selections. 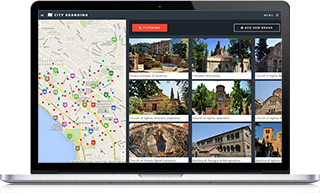 Aiming to become an outstanding tourism destination, to support the local economy and to improve its citizen’s quality of life through leading technologies, City of Thessaloniki decided from the very beginning of the project to cloudify applications that are related to entrepreneurship and quality of life in the city of Thessaloniki. Thessaloniki Municipality, along with URENIO-AUTH adopted a user centric methodology, including meetings with stakeholders and municipal services, training sessions and validation sessions with end users, dissemination activities and so on. Thessaloniki Municipality organised meetings with stakeholders and municipal services, training sessions and validation sessions with end users, as well as dissemination activities. During these meetings/events, the pilot partners distributed informative material about the overall project and leaflets including the different candidates for migration. 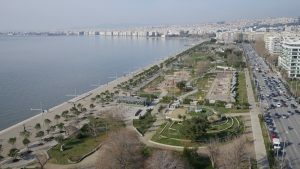 Thessaloniki Municipality was particularly keen to select applications related to entrepreneurship and quality of life in the city of Thessaloniki. In addition to that, external stakeholders also selected applications for touristic promotion in the city. 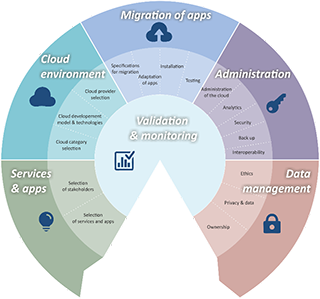 In order to monitor the three services selected on the first stage, Thessaloniki Municipality established a four dimensions group of indicators for each service separately analyzing supply, demand, dissemination and the level of validation. Improve My City: Enables the citizens to report non-emergency local problems such as potholes, illegal trash dumping, faulty street lights, etc., through web, Android and iOS applications. Cloudfunding: Supports local communities to collect money for social and charitable purposes. 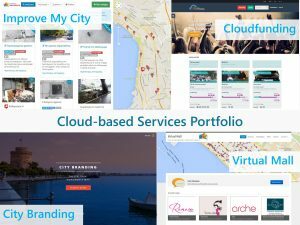 City Branding: Promotes the identity of the city using virtual tours while connects the commons with local shops and services providers. City of Thessaloniki – Thessaloniki on the clouds!